Bloomington, Ind. – A new animal study concludes that fewer fibered embolization coils are needed to achieve acute occlusion when compared with similar bare metal coils. 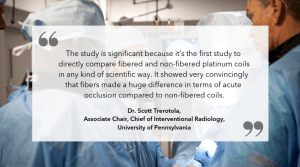 The study was presented today at an industry sponsored symposium during the 2019 annual meeting of the Society of Interventional Radiology (SIR) in Austin, Texas. Embolization is a nonsurgical, minimally invasive procedure performed by a physician to block or reduce blood flow in arteries and veins. To access the full article visit JVIR.